Monkeys! Birds! Close to the Beach and everything you want to do! Very Popular!! Casa Carolina is Manuel Antonio´s most exclusive vacation rental home. Perched on a hilltop with beautiful panoramic ocean views, Casa Carolina is without a doubt in a class of its own. Every last detail in the design and decoration of Casa Carolina insures that your needs will be catered to during your stay. The breathtaking sunsets from the infinity pool and fully equipped outside grill area will inspire you and take you to a new level of relaxation. Here, as well as from the balconies of three of our suites, you will enjoy the serene blue of the Pacific Ocean. Frequently seen from the home are monkeys, parrots, ducks and many other species of birds. Casa Carolina is 5-Star class with a down-to-earth welcoming feel as the services are brought to you. Casa Carolina features a concierge manager who can arrange adventure tour bookings, a day of sportfishing on the Frenzy, in-home massage and spa services, advanced grocery shopping and chef services. 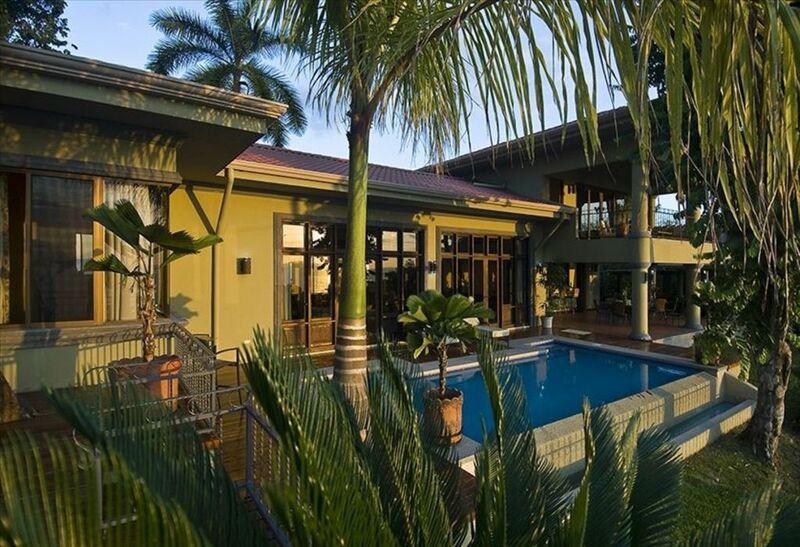 Manuel Antonio offers an abundance of natural beauty and excitement, and Casa Carolina is your perfect home base for exploring what the area has to offer, including world-class sport fishing, eco-touring and extreme adventure activities as well as indulging in the high-class comforts of the home. Come and experience all that Casa Carolina has to offer! Outside dining seating for 20 is available. Private balcony off the master suite with amazing views. Fishing charters with Frenzy Sportfishing can be arranged. Your concierge, Willy Jimenez, can arrange all aspects of your Costa Rica vacation including tours, shopping and transportation. Private chef services are available and reasonably priced. Casa Carolina is perfect for couples as well as families. Do not hesitate to book this property, it is truly incredible and will exceed your expectations! We were a group of 6, 4 adults & 2 teenage girls. The house could have easily accommodated twice that and still would have felt more than comfortable. If you stay in the separate, but still under the same outdoor roofline, "chicky suite", you'll probably be awoken by the 6am-ish troop of monkeys landing on the roof. It's so cool, just incredible to experience, so get up, get your coffee and sit outside under the covered patio with your binoculars and watch all the nature around you. Staying at this house and all it offers for everyone in your group is just unbelievable! One of the best vacations we've ever been on!!! Eleven wonderful fun friendships were made!!! Casa Carolina and team were the absolute best, amazing fresh fish dinners, in home spa, white water rafting with fresh fruit and a water fall stop, beautiful beaches, souvenirs, off shore and in shore fishing, dining at the local restaurants and marina, sunset catamaran, monkeys, and just a blessing that we were able to experience Costa Rica!!! Susan thank you so much for the fabulous review! We are delighted that you and your friends had such an enjoyable stay at Casa Carolina. I will pass along your kind comments to our staff! A Life Time Memory Maker!!! We couldn't have been more happy than picking Casa Carolina as our option of stay for our family's first time visit to this beautiful country. Once we booked our stay the customer support leading up to the trip with Charlotte was awesome. She was quick to respond about questions about the house, logistics and pre-planning. Once we arrived in country the concierge "Willy" took over and was happy to help plan our daily adventures, offer advice, insight and other miscellaneous request. The house staff of Lisabeth & Saul was truly memorable. They are two of the nicest and sincere human beings my family and I have ever met. They work so hard to make your stay as enjoyable as possible. Whether it was cleaning our rooms and laundry, cooking the most delicious breakfast, keeping the house spotless or taking part in Saul's since of humor and sharing stores is what I will cherish the most. By the end of the week the two felt like part of the family! Oh by the way, Saul has a 6th sense for monkeys. Ask him every morning if the monkeys are near by. If they are close and I still have no idea how he knew this, he will call them upon request. Misael, the house driver was nice and friendly as well. He can help you with all your transportation needs and take you to some really cool insider spots. Finally the house, in one word, WOW. It is truly a very special place. When you enter the home for the first time your jaw will drop to the floor. The listed pictures does not give it justice. The views from the kitchen, bedrooms, bbq island, pool and Chickee sweet are nothing short than gorgeous. My family is already missing the sights we saw every morning while we ate our breakfast, as well as watching the sunsets with a cocktail in hand. Lastly as being first time visitors, security was also a concern for a couple members of my family. Those concerns were met. The house is located in a very safe area, it is gated and has a grounds guard at night. Everyone felt very safe. In summary, our family is talking about when we can return to Casa Carolina. Thanks for the life time of memories!!! Wow thanks for the incredible review! This is one of those reviews where it's hard for me to know where to start to say "thank you" for choosing Casa Carolina. The most important thing is that you had a wonderful vacation in Costa Rica and were very pleased with Casa Carolina. I'll pass along your kind comments to my entire staff. I am sure they too are looking forward to your return! Casa Carolina lived up to, & exceeded, our every expectation!! We could not have asked for a better vacation for our first trip to Costa Rica and we will be back! Jamie Walker, the owner of the Casa Carolina, spent about 30 minutes on the phone prior to our visit to walk us through what we could expect for the week. It was so nice of him to spend that time with us-we felt very prepared for the trip. We then communicated with Willy Jimenez, who oversees the property in Quepos. One of the very best parts of the trip was Willy & his staff. They took care of every last detail of our trip with ease & kindness. We looked forward to seeing them everyday! Willy arranged things like transportation to & from the airport, our fishing trip on the Frenzy, vanilla farm tours, etc. He was outstanding! We also can't say enough about Lisabeth & Saul, who worked at the house everyday. They are two of the kindest people you will ever meet. Lisabeth washed our clothes each day, made beds, laid out fresh towels & kept the house spotless. Saul took care of us from sun up to sun down with grocery shopping, arranging our driver needs, setting up reservations....whatever we needed, he made it happen. Both Lisabeth & Saul cooked breakfast and dinner for us several times throughout the week. The rice and beans & veggies are to die for-we will miss that dish! We also loved our driver, Misael, who took us wherever we wanted to go & whenever we wanted to go. He was awesome. We also loved our airport transfer driver, William. We just can't say enough about the staff of Casa Carolina. Everyone of them was so kind, funny & easy to work with-we definitely made new friends! Casa Carolina itself is incredible. It sits up high with a view of the Pacific that is just gorgeous. There is also a terrific view of the Pacific from the shower in the Chickee apartment...what a way to shower with the window open and that view! Swimming in the infinity pool also provided beautiful views of the Pacific We spent a lot of time in the pool, adults & kids-terrific! The monkeys arrive everyday & the wildlife watching is amazing! The house is very well appointed, w/ comfortable beds, a well stocked kitchen, great dining & living area. One of the best parts of the house is the outdoor kitchen/dining area. Bottom line, Casa Carolina is amazing-the house, the staff, the country, the views. We feel so lucky to have stayed there and experienced Pura Vida from Casa Carolina! Great location! HI Tracy! I am glad to hear that you guys had a great stay at Casa Carolina. Thank you for the kind words in your review. I'll pass them along to Willy, Liz and Saul. They will be delighted to hear this. I remember telling you in our conversation that this will be the easiest vacation that you will ever have! I believe it turned out that way. I hope you will come back. The monkeys miss you! One of our favorite vacations! The property is beautiful, and the staff was amazing! Thanks for the 5 Star review! We're glad you had a great time once again. I will pass along this review to our staff. They always love to read them! Outstanding stay at Casa Carolina! Family and I, (6 total), just returned from 5 days at Casa Carolina. The home is beautiful, indoors and out, and is very well appointed. Although we filled our days with various excursions, I would've been more than happy just staying in and enjoying Casa Carolina and the amazing views it offers of the Pacific and all of the local wildlife. During our stay, we enjoyed visits from Macaws, a Toucan, three types of monkeys (Howler, Capuchin, Squirrel), and even had a sloth on the property! The accommodations and the wildlife were certainly memorable, but the icing on the cake was the awesome duo of Saul and Liz! They were fantastic and took such great care of us. We've stayed in a lot of nice homes... this one is one that we'd definitely return to! Michael thanks so much for your great 5 Star review of Casa Carolina! I am glad to hear that you had a chance to see the scarlet macaws. They really are beautiful. We are seeing them much more frequently now than even a few years back. Of course the monkeys are our usual visitors and can be quite entertaining! I'll pass along your kind comment to Saul and Liz. They sure do work hard to make sure that our guests have a great time! We do hope that you will choose Casa Carolina again for your vacation! Many adventure tours are available including world class fishing, Rainforest Canopy Ziplining, Surfing, Bird Watching, and lots of visiting Monkeys!